For emergency use to adsorb swallowed poisons. Shake vigorously to suspend charcoal before use. Remove foil seal underneath cap and replace cap. Cut off delivery tip of bottle 3/4 inch from end to insert drinking straw included with bottle. Pull or cut off tip from included cherry flavor and squeeze flavor into straw. Administer entire 240 mL if possible. Repeat dose immediately with Insta-Char Aqueous base product if possible. If previous attempts to contact a poison control center, emergency medical facility, or health professional were unsuccessful, continue trying. Keep patient active and moving. Save the container of poison. 15-30g activated charcoal or 1-2g per kg of body weight. 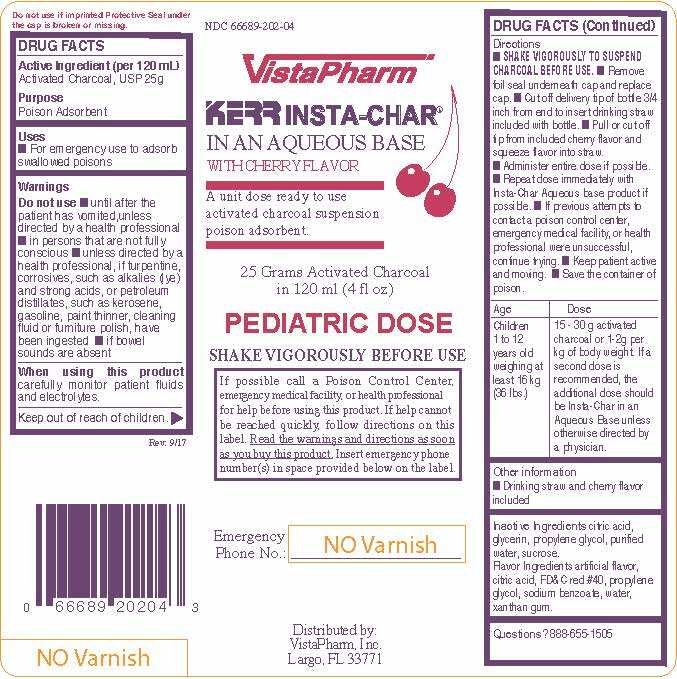 If a second dose is recommended, the additional dose should be Insta-Char in an Aqueous Base unless otherwise directed by a physician. 50 - 100 g (1-2 adult bottles) or 1-2 g per kg of body weight. If a second borrles is recommended, the additional bottle should be Insta-Char in an Aqueous Base unless otherwise directed by a physician. The product packager shown above represents a sample of that currently in use. Additional packagin may also be available.